We all know how important it is to clean our face off any makeup and dirt before hitting the sack. But, we often tend to forget that it is equally important for us to keep our makeup tools, especially brushes, clean as well. Dirty brushes can lead to a lot of problem that you can ever imagine. Not only it will be difficult for you to apply makeup due to accumulation of products on the brush, but it can also harm your skin. We avoid cleaning brushes sometimes because we don’t know how to properly clean brushes, sometimes we think cleaning brushes often are not good for the bristles and most of the times due to sheer laziness. Bacteria sit on the bristles of your brushes and when you touch your clear skin with that brush, they just transfer to your skin, causing clogging of pores, acne, rashes and many other skin complications. If you use your brushes to do your makeup regularly, you should clean your brushes at least twice a week. Being a makeup artist and a beauty blogger, I have to use and clean my brushes daily; I just can’t use the same brush on different people. So cleaning the brush everyday is necessary and becomes ‘a task’ at the end of the day. Just swirling them on my palm with the cleanser was not working so great enough and I was looking for something which can clean my brushes in a jiffy. But all the “good” brush cleansers available in the Indian market come with a high price tag. Then I decided to invest on a cleaning pad or glove, but spending almost Rs. 2000-3000 on the Sigma mat, well it seemed steep. I kept on looking for affordable options when I saw this BrushEgg on Ebay, I got it for INR 120 + free shipping. The BrushEgg is an egg shaped, small, silicon brush cleaning tool. It has two patterns, the knobs for stubborn stains and small brushes and the grooves for big brushes. It fits right on your fingers, which provide grip and ease of cleaning. If you are not comfortable holding it on your fingers, you can hold it inside your palm. It does not slip or slide and fits well on the palm. This is super simple to use. Just pour a few drops of your cleanser on the scrub pad, wet your brush and swirl on it. Immediately you can see all the products and grease coming off the brushes. With my super mild homemade cleanser, eye shadow and any powder products come off in single wash and cream products take 1-2 washes depending on the accumulation. CLICK HERE to see the full demo. I don’t know how I will put into words the excitement I have over this little magic tool. It not only did take all of the products out but it cut my cleaning time by at least 1/4. I use the small knobs on top to lather and clean my small brushes and the grooves for cleaning larger brushes. And I don't use any fancy, expensive brush cleansers; I use my homemade brush cleanser and it works wonder. 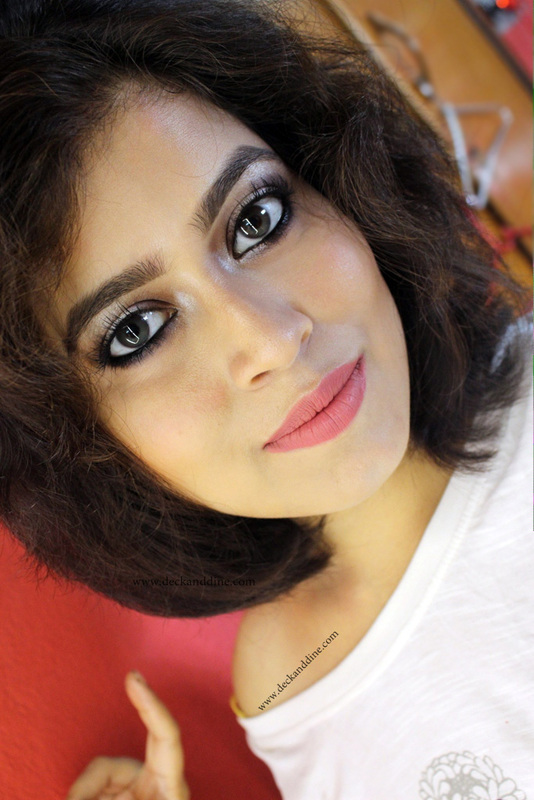 Before, it was so hard for me to take off the product accumulation just by swirling it on my palm with the same cleanser; it used to take for-freaking-ever. 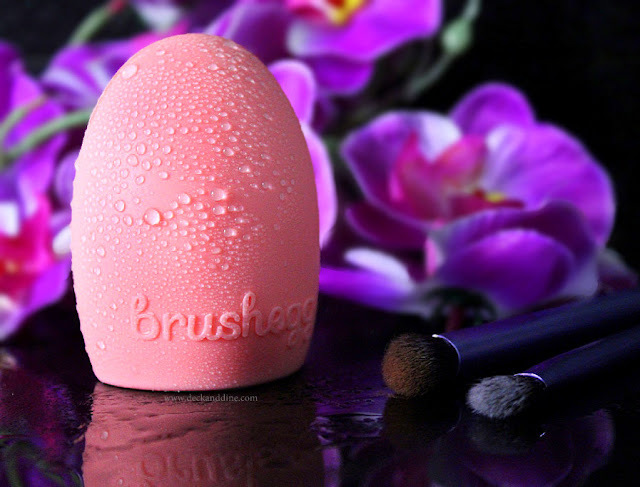 This Brushegg helps release built up products in seconds.This cleansing tool has made cleaning brushes so much better and quicker! I love this Rs.120 masterpiece. Fits on your fingers for strong grip. If you want, you can fit it on your palm as well, no gliding or slipping. Two patterns, knobs for stubborn stains or smaller brushes and grooves for cleaning larger brushes. Removes the product accumulation in seconds. It air dries completely and quickly. Soft and flexi silicon material doesn’t harm the bristles. Cons? Are you kidding me? Just those beautiful three words… “A MUST HAVE”. heard a lot about the makeup brush cleanser. After reading your review it looks like like a must have. Yes.. it is indeed a must have.. Thank you. That means a lot, coming from you.. You are a pro in photography..You have a distinct style, I can always tell a shot has been taken by you.. I recently got the brush egg but I haven't started using it. It definitely sounds good. I too have this and love how effectively it works! Lovely review!